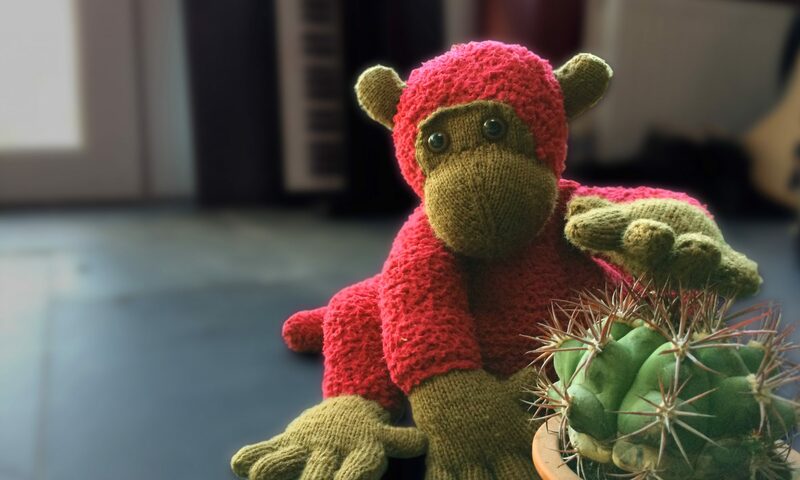 The Wool Monkey – Totally addicted to knitting, crochet and cacti. 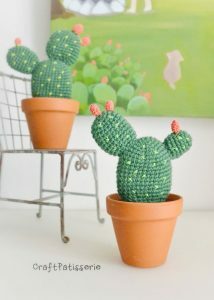 Totally addicted to knitting, crochet and cacti. It’s taken me quite a while to get around to writing this pattern up. It’s been such a success that my little Dutch Pixie absolutely loves this cape and hasn’t stopped wearing it ever since I gave it to her. 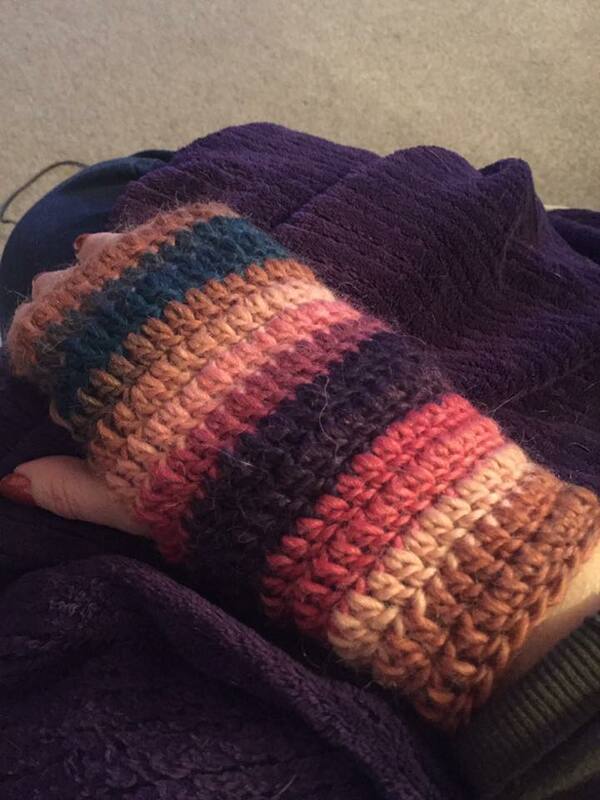 I think I started knitting it back in the Spring. 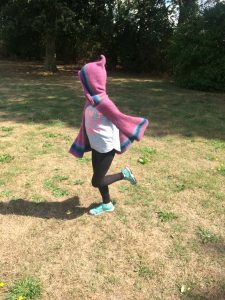 It was just an idea I had for a simple cape that I thought my eldest daughter would get some wear out of. You know what kids are like, they often don’t want to wear a coat, even when it’s freezing cold outside. My daughter often doesn’t even want to wear a jumper either and to be honest there isn’t enough meat on her bones to keep her warm without one! (We do feed her plenty, she just never sits still) So, I thought a cape could be a good solution. I think that I actually half knitted this cape and then pulled it out and started again at least twice. Sometimes I get a little indecisive about how I want the finished item to look. Eventually I realised that time was moving on and summer was rapidly approaching and that if I wanted it finished for our trip to Holland in the summer then I needed to get a move on. The next time I started it I decided to double up the yarn and knit with it twice as thick. It would be quicker (and warmer) that way. It was the detail that was slowing me down though I think. I tried several styles and kept changing my mind. In the end I chose just a few lines of lacy holes, down the sides, down the back of the cape and across the top of the hood. Just a little bit of interest and really good way of hiding the increases to give a lovely shape. Plus, I wanted it to have a pointy hood. 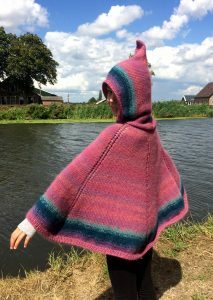 A proper pixie cape should have a pointed hood after all. 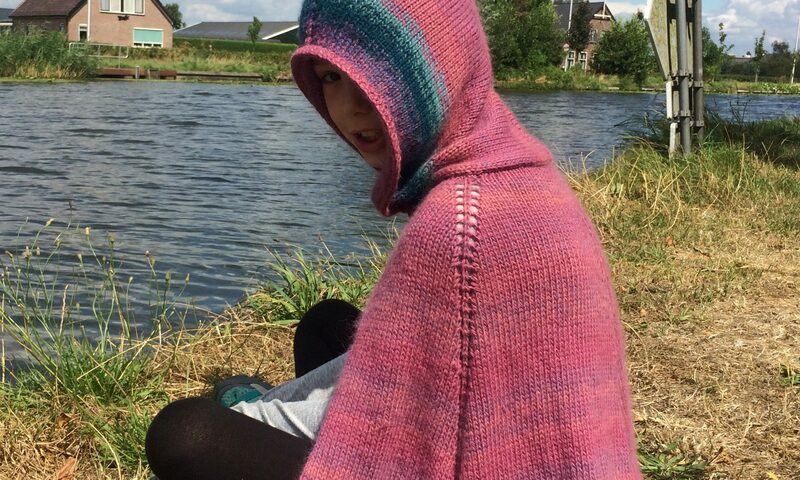 So, finally, on the ferry on the way to Holland, (nothing like leaving it until the last minute), I sat sewing the ends in and adding the button fastener until the cape was completed. We had a fabulous holiday and my little Pixie danced around the canals wearing her cape the whole time. The only tricky part was getting her to stand still long enough to get a good picture! 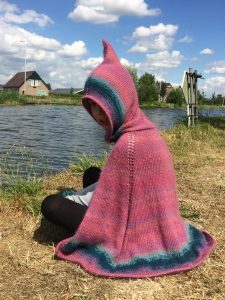 If you’re interested in knitting a Pixie cape, the pattern is available from Etsy. 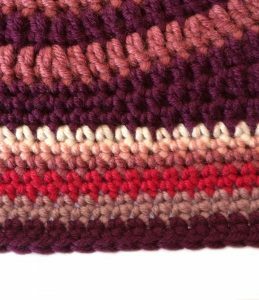 It’s a fairly straightforward knitting pattern and just uses stocking stitch. 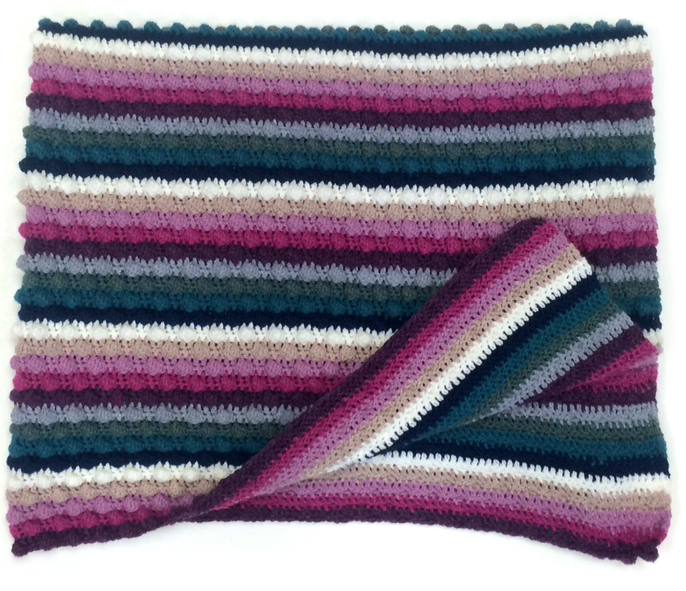 The yarns are worked double so that you can create a nice blended looking set of stripes. If you have questions, do get in touch. This is my big brother, Pete. 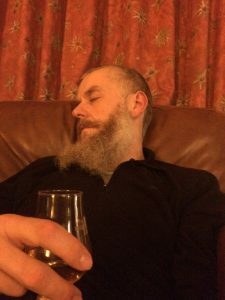 As you can see, he likes to relax on the sofa, with a whisky after a hard days work. Snoozing seems to be a common occurrence too. We don’t often give each other serious presents, just joke ones mostly. But, for some strange reason, just for once last summer, I thought he might like a real present. So, a couple of weeks before his birthday I asked him if there was anything he would like. “I’d like my own blanket please. And I want you to make it for me”. 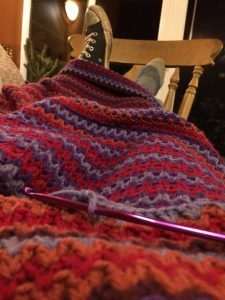 I was immediately delighted that my big brother wanted a blanket of my making, but then realised that there was no way I could make one in two weeks! I’m good, but not that good. So, I warned him that I would make it, but it might be a Christmas present rather than a birthday present. I even let him choose his own colours from my stash. (I was pretty surprised at the colours he choose, but they worked well together actually). The work continued for months. 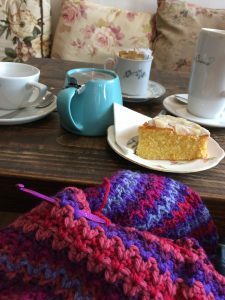 Often whilst eating cake and drinking coffee at the Wool Monkey knit and chat groups. Until it became too big to take around with me and I was finally restricted to making it at home. The advantage of this was that it kept us both warm whilst I was making it. (Me and my better half that is). Eventually it was done. And just in time to be wrapped up for Christmas. … I think he was even smiling. He wore it all afternoon on Chirstmas day anyway. 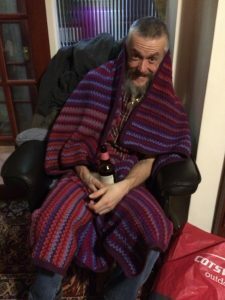 The only awkward thing about the blanket was that I foolishly thought that my brother would share it with his other half, as she particularly liked the colours he chose. But no, he won’t let her near it. So now I have to make another one! It’s really, really easy. 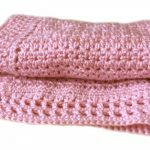 So easy that I think this is a beginner’s pattern. 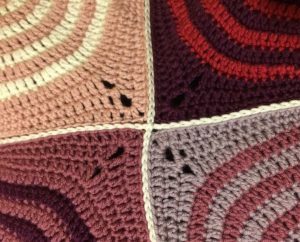 (Or a really relaxing pattern for those of you with more experience). 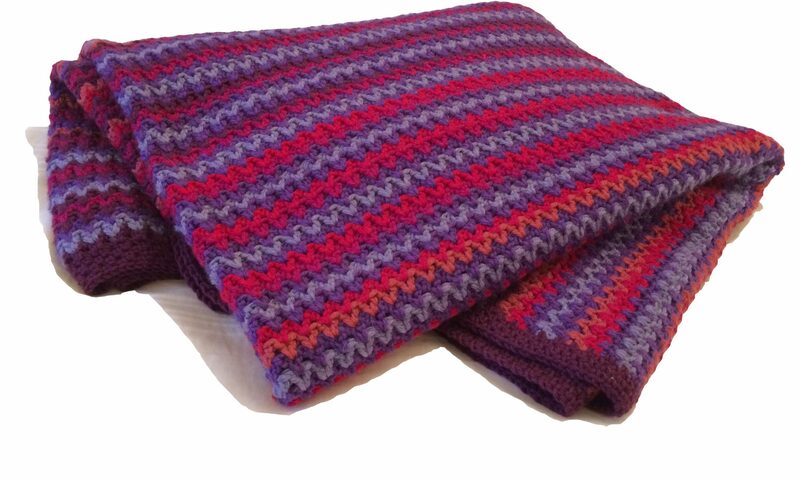 It’s also a definite winner as a man blanket and a Christmas present! 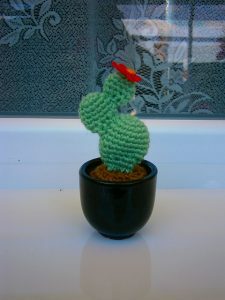 As you may have realised by now, not only do I love crochet and knitting, but I also love cacti and succulents. 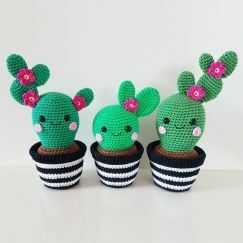 So, I thought I would start to create some patterns to go with my cacti, as well as giving you a bit more information about the plants themselves. 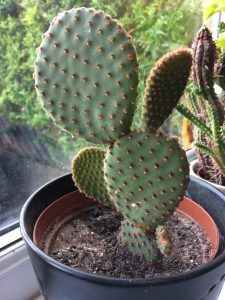 Whilst I was thinking about doing this recently an old customer got in touch with me completely out of the blue, to see if I had created any cactus patterns yet. What a pleasant surprise and coincidence. 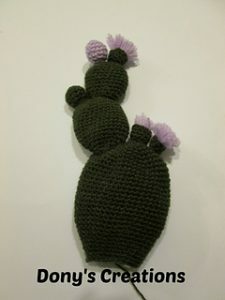 She asked if I would create a pattern for an Opuntia. 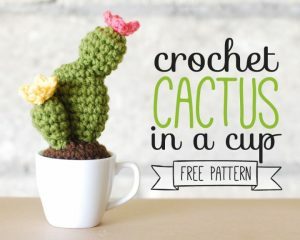 So, that was my plan, but then as I started to look around, I realised that there were so many knitted and crocheted cacti patterns already out there for free that it would perhaps be a better idea to just have a look at some of those instead and see if any were worthy. First thing is first though. 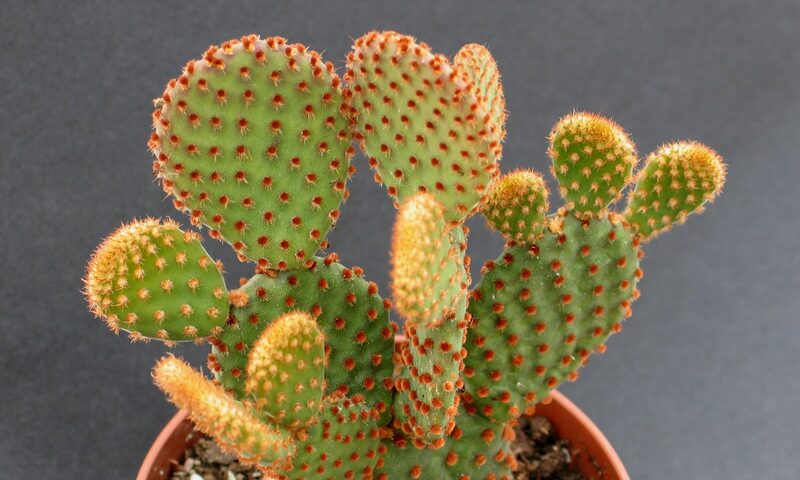 So, the cactus genus Opuntia contains many different species, with many different common names, such as the prickly pear, bunny tails, beaver tails and the barbary fig. You must have heard of some of them at least. It’s really widespread, originating throughout the Americas, but with man’s help has now been spread worldwide. 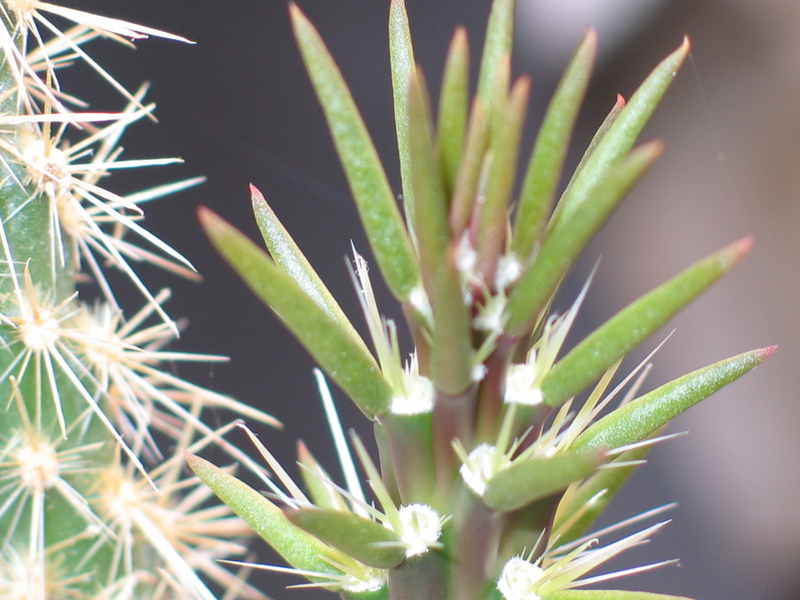 In some places it is even considered to be a weed. They do grow exceptionally easily. This is a cutting I planted in January this year. It was just a couple of paddle shaped leaves then, but started to sprout new segments straight away. (Sorry about the sideways picture). This is how much it has grown up to now (June). It might not look like much to you, but it’s fast for a cactus. 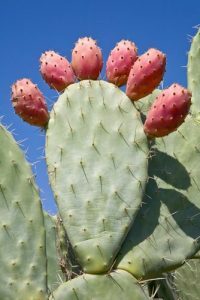 Opuntia are easily recognised by their usually flat, paddle, oval or round shaped stem segments. 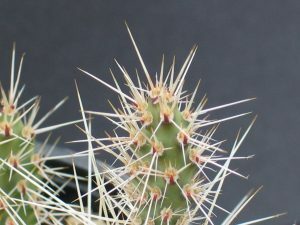 The spines are often densely clustered on the areoles. 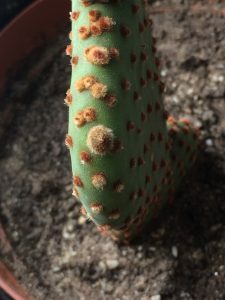 These are the areas on the cacti where you usually see the spines coming from (the spotty bits on the pictures above) and trust me, you don’t want to touch them. 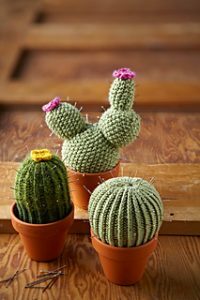 They often look like soft, fluffy little pads, but really, they’re not that soft, they are composed of hundreds of tiny spines which will almost definitely get into your skin and they are really, really, really irritating! 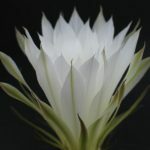 Some of them also have long, deadly looking spines in addition, as if they needed the extra protection!? 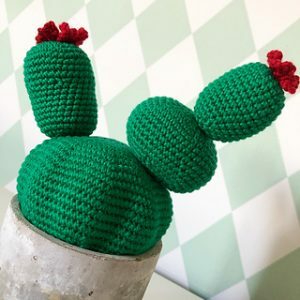 Here are some of the best Opuntia crochet patterns I found. The first few are free too, which is always a plus! This one is nice, but one you have to pay for. This is a nice pattern, but I’m not sure what language it is in. This is really nice pattern too, but it’s in Spanish or Portugese (I think). This is quite a chunky opuntia. These patterns are super cute, but you have to pay for these. 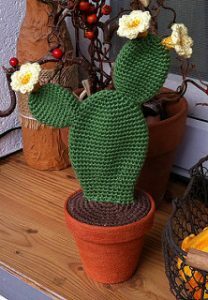 It turns out that there aren’t that many knitted cactus patterns that are particularly Opuntia shaped, most of them are crochet patterns. Here are a couple that I did find and at least they are free. 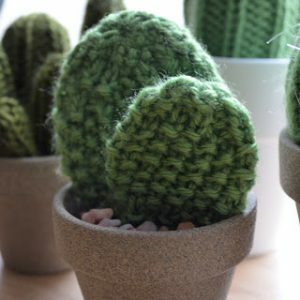 If any of you are desperate for a knitted opuntia pattern which is better than these then let me know and I will write one. 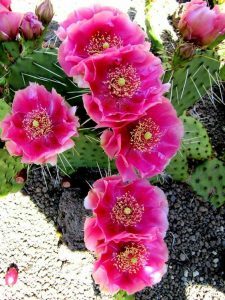 In the meantime I hope you enjoyed the opuntia! I love road trips. Especially road trips round Scotland when the sun is shining. 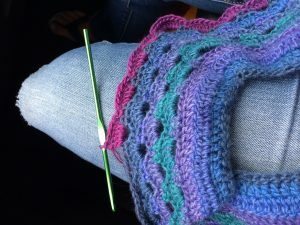 The best bit about road trips is that they give you the time to do new projects whilst in interesting locations and my crochet goes eveywhere with me. 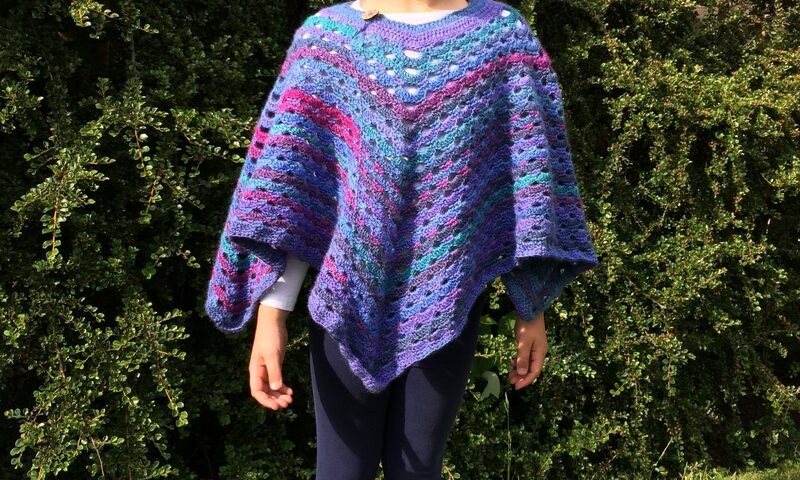 So, this time, I decided that I would create a new kids poncho. 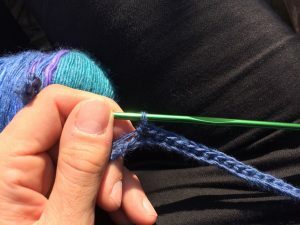 The best bit about journeys that take a while, especially if you have somebody else to do the driving, is that you have an excuse to sit and crochet (or knit) for hours at a time, just watching the scenery roll by. My new poncho grew quite a bit on the way to Scotland. Wild camping in stunning locations. 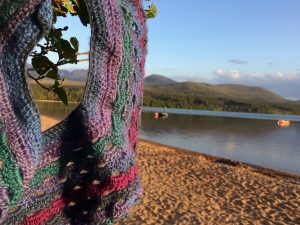 The location was soooo good that the crochet slowed down a bit though, whilst we went to climb a few Cairngorms. (They are the hills in the background in case you were wondering). 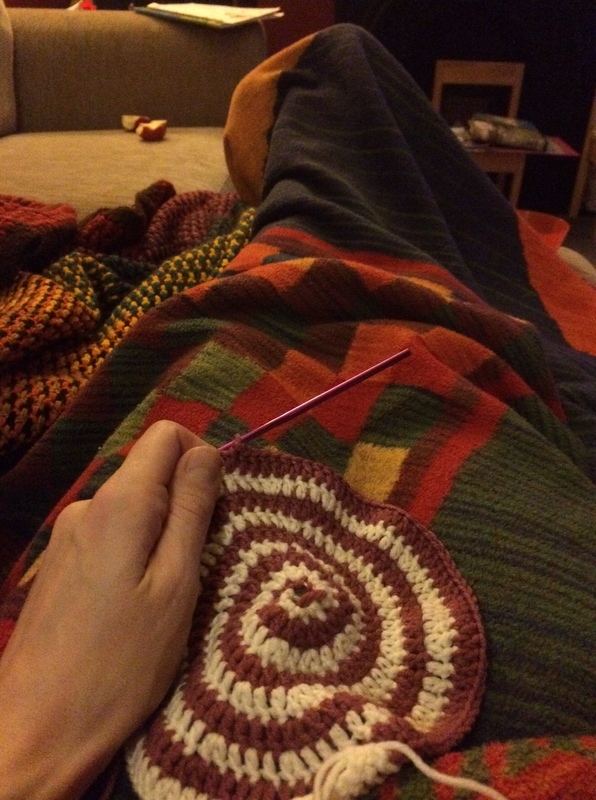 So, back to the crochet. It has been one of those projects where I just set off with a hook and some yarn and see what comes out. It’s simple shells this time. 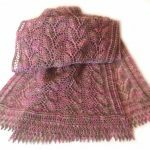 The yarn I decided to use was some Louisa Harding Amitola which has been in my stash for quite some time. 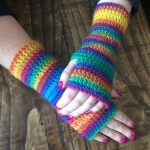 It’s self striping, so you get a lovely array of colours when you crochet with it. It is a little bit on the thin side though, so I tend to use it double stranded, to make it more like DK yarn. This has the bonus effect of giving a much wider range of colour blends too, where you get two strands of different shades blended together. Crochet here, crochet there, crochet everywhere. I love being on holiday and being able to crochet, it’s idyllic. No holiday would be complete without a few pints of good ale too. 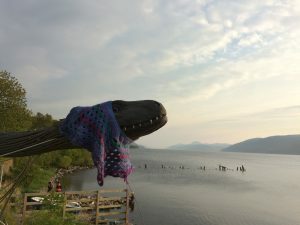 Eventually we ended up camping on the shore of Loch Ness. It wasn’t part of the plan, but was a good place to stay. Nessie was in total approval of the crochet project too, which has to be a good omen. And finally, time to head home and say goodbye to another road trip. Scotland is beautiful, there is no disputing this. I had only two balls of yarn left and the project would be finished too. I’d say it was a successful trip all round. Back to the real stuff. The project! 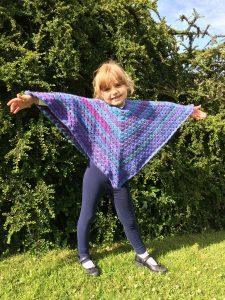 So, it has become a very square poncho, with an opening for the neck and head to make it more versatile and easy to vary the size. My 6 year old adores it. Sometimes it’s a great idea to ask your kids what they think you should make next and sometimes it backfires, big time. 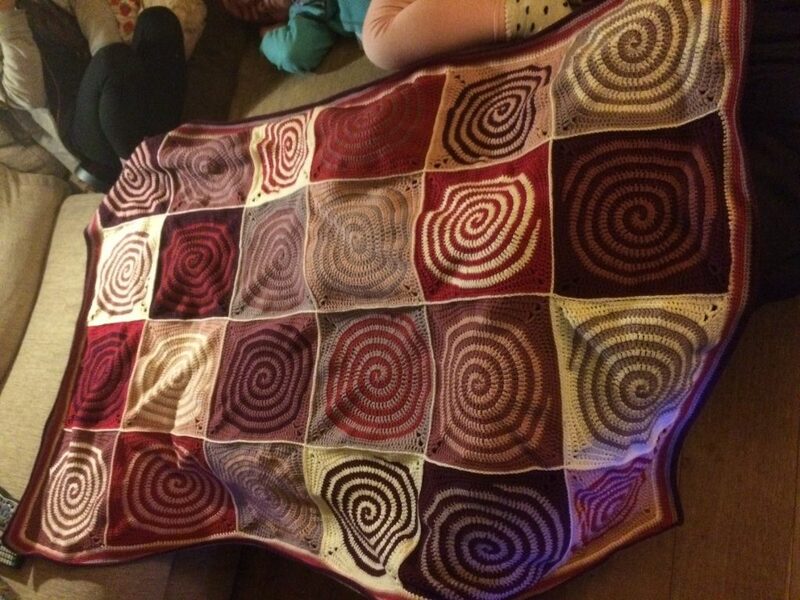 I made the mistake of asking my girls if they would like it if I made them a blanket each. I told them that it could be their own choice, unique to them. Of course they said yes and then promptly told me what sort of blankets they would like. The youngest requested spirals. Spirals! Once my brain had recovered from the panic of wondering how I was going to do spirals I naturally said yes, of course you can have spirals. Hmmmm. Spirals. How shall I do spirals. Hmmmmm. Spirals. 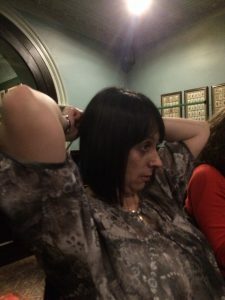 (This is how I spent the next day or so, pondering spirals). 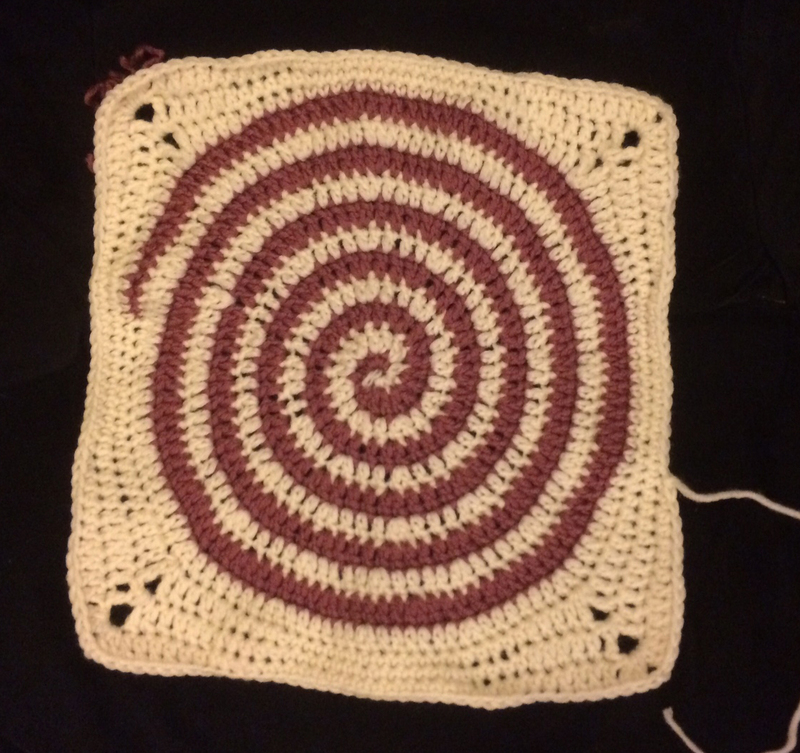 After several attempts, and lots of frogging, I finally had a spiral in a square and a set of colours chosen by my 5 year old that would hopefully work. All I had to do now was create 23 more spirals! I must admit, it doesn’t look very good does it. Since then, I have been spiralling everywhere. 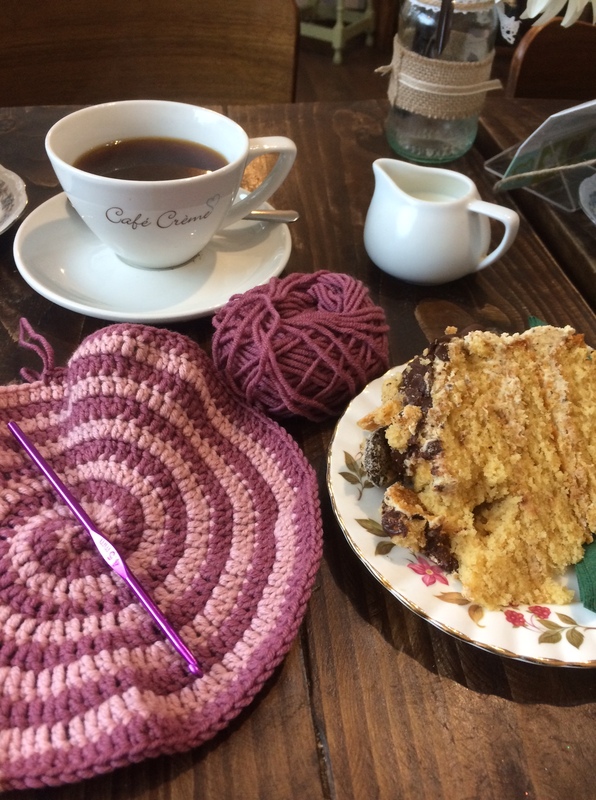 Spirals in the cafe, with coffee and cake. Spirals in a coffee shop. Again. I think you probably get the idea by now that I have been doing spirals everywhere I have been recently. I have been trying to get one done everyday, so that it didn’t become a burden and I still had time for other projects. 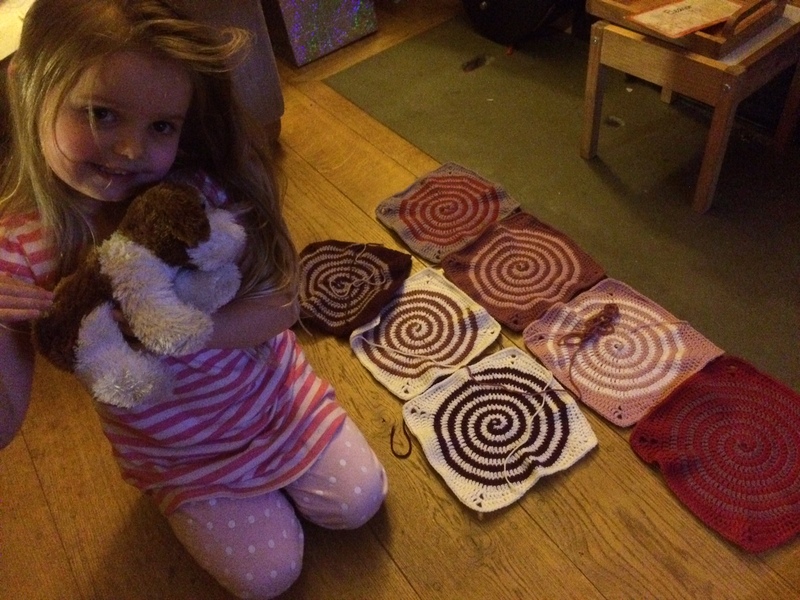 My youngest was pretty pleased last week with how her spirals were looking. Everytime I add to the pile she lays them all out on the floor. She says she is planning how they are going to fit together. Hmmm. Four weeks later and I have a large pile of square spirals. Now begins the bit that I don’t really feel like doing – sewing them all together. Grrrrrr. We laid them all out on the bed, trying to arrange them in such a way that meant all the colours were evenly spread out. This is trickier than you might imagine. 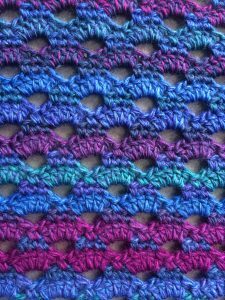 Then, after a little deliberation I decided to use the slip stitch method to join all the squares together. It gives a nice neat edge to all the squares and is fairly quick. (Always a good thing). Once they were all joined together, all that remained was the edging. Several rounds of edging as it turned out, but nevermind, I thought it finished it off nicely and sometimes it’s worth putting a bit of extra effort into the edging on a large blanket. 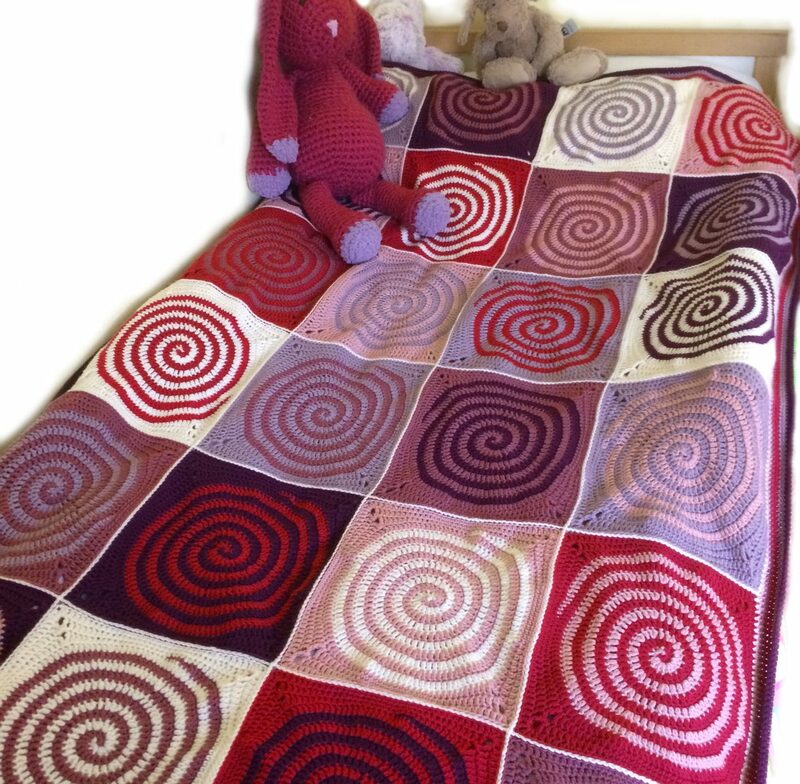 Here it is, the finished blanket. My daughter loves it and has used it on her bed every night. I was worth the effort I reckon. 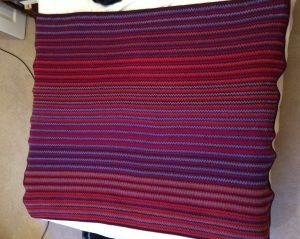 I have often been asked the question ‘how much yarn do I need for a blanket?’ To which, of course, there is only one reply, ‘depends how big your blanket is going to be’. 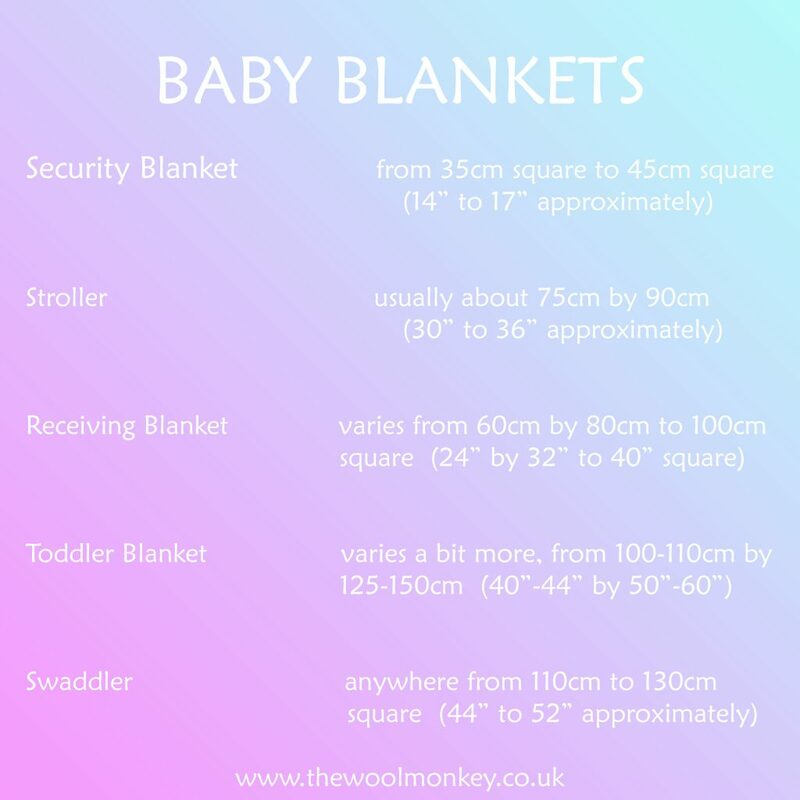 Then of course the next question is usually, ‘how big does my blanket need to be?’ Sounds silly, but there are no fixed rules about how big a blanket should be, just make it to the size you want. OK, so that sounds like a bit of a slack answer I know. I have done a little bit of digging to find out what sort of sizes people generally consider to be standard. Or standard-ish at least. Some people have their own personal set of sizes that they tend to work to and others like to make it up at random. I know I have a rough guide in my head and I tend to vary it depending upon the project. 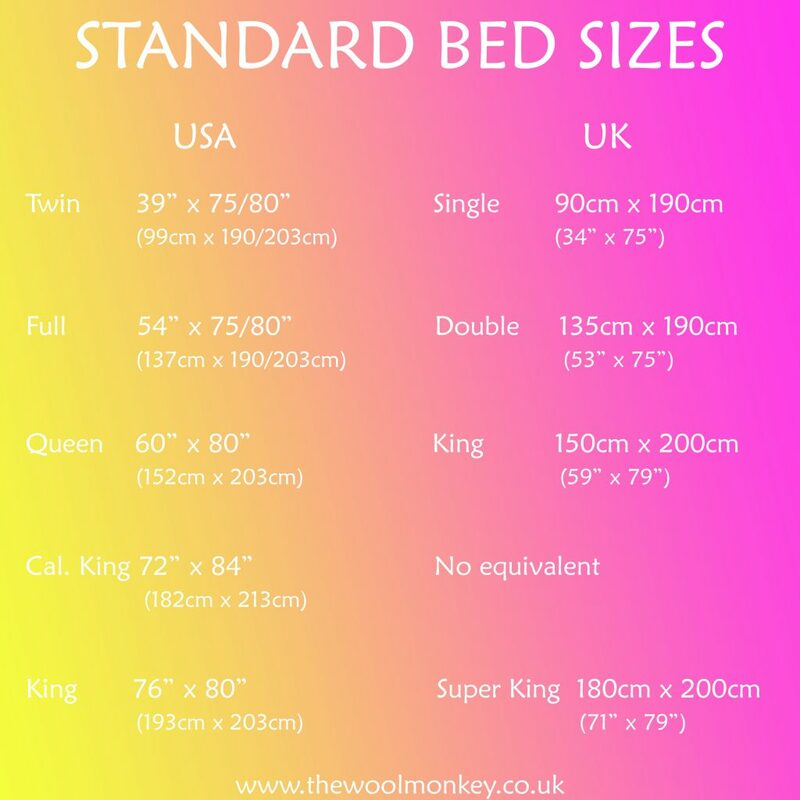 One thing to bear in mind, if you are making a blanket for a bed, UK bed sizes and US bed sizes are different! So most of you will have at some point made a baby blanket I suspect. The sizes do vary a little bit, but most of them out there seem to fit into the same categories and approximate sizes. Not necessarily for adults, but it just gives a different category from babies. These can vary quite a bit more, especially between the continents! So, I had a look at the bed sizes first as the standards seem to vary slightly. Here is a comparison between the USA and the UK. Obviously there are many other variations around the World, but there is a limit to how many I can list and these two seem to be pretty common. 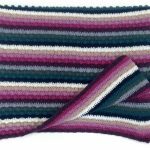 When it comes to the blanket sizes, as oppose to the actual bed sizes there seems to be a lot more discrepancy as to how a blanket should fit a bed. Should it just reach the edges? Should it overlap the edges and drape down the sides? Should the top be long enough to cover the pillows? Is it just a decorative thing? I hope these help some of you a little bit. If not my advice when making blankets is to make them big and just keep going until you’ve had enough of making it and then it’s big enough. 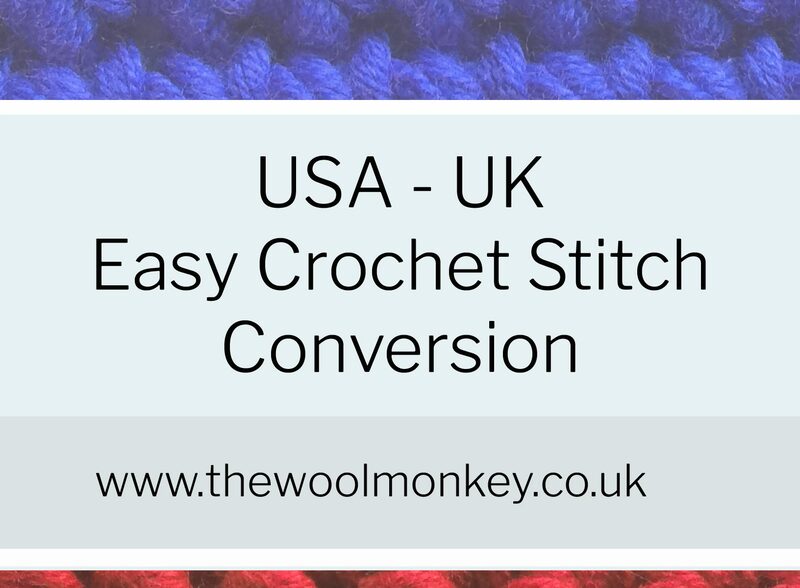 Did you know that the USA and UK have exactly the same crochet stitches, but they are given different names? I think the rest of the World uses either one or the other too. So, it’s useful to know how to convert them. 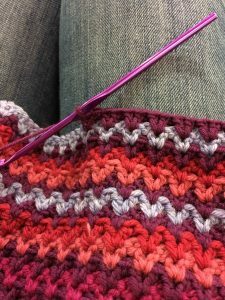 It can get a little confusing though, especially when downloading crochet patterns from the web as it’s not always obvious which continent they have come from. So, here is just a little guidance, to help you easily convert between the two. 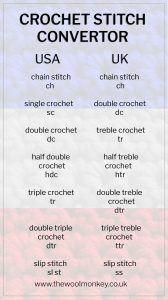 So, next time you get a crochet pattern and you’re not sure where it has come from, the biggest clue is that if it mentions ‘Single Crochet’ then it’s definitely North American. 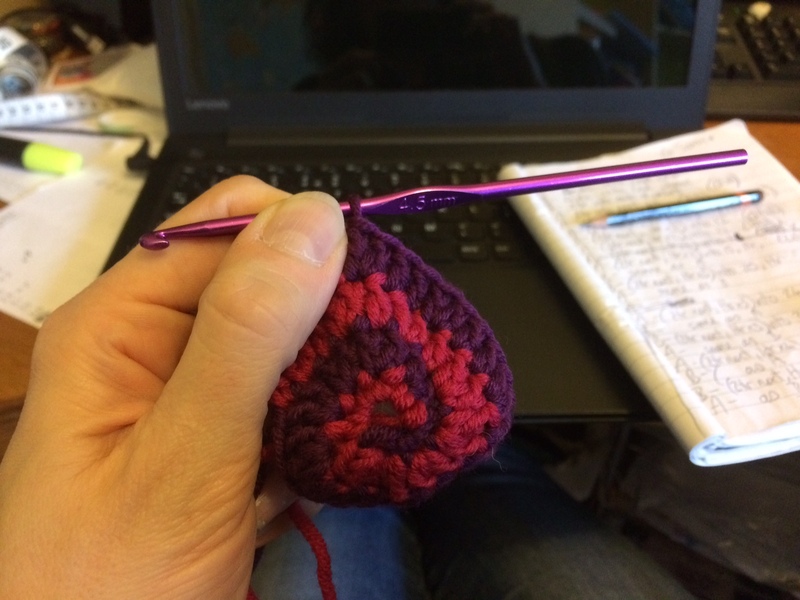 (There is no Single Crochet in the UK terminology). Or, if you start to work on something and it really doesn’t look anything like the picture on the pattern, then maybe it is not from the continent you expected. 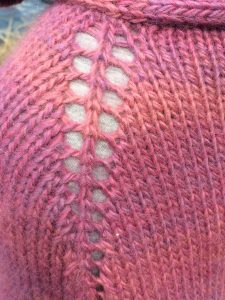 The easiest way to convert your pattern is to read through it and do a straight replacement. So, for example, if you are converting from USA to US, work through and find all the mentions of ‘dtr’ and replace them with ‘ttr’. Work your way through each of the stitches until you have replaced them all. But, beware, always work from the largest stitch to the smallest, otherwise you could get in a pickle. You could end up replacing all the ‘sc’ with ‘dc’, then accidentally replacing all the replacements you have already done with ‘tr’, which would make the pattern completely wrong. Just a little warning, that some patterns may use different abbreviations to the ones above. Always check your pattern to see what abbreviations are being used before you start. That’s all there is to it. The actual working of the stitches is exactly the same. I hope it makes sense to you. If not, get in touch and I will work through it with you. The Wool Monkey is coming back to you full throttle very soon. 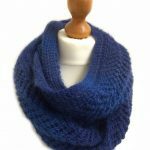 We are very nearly finished building our new site now and transferring everything from our old website, www.woolmonkey.co.uk across to here. We hope you like the new site and we hope to bring you some new and exciting stuff very soon. 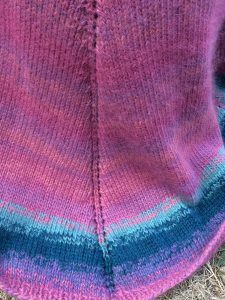 Here is just a quick post in celebration of the Wool Monkey knit and chatterers. (I call them chatterers as they always have plenty to say and being quiet is definitely not one of their strong points). 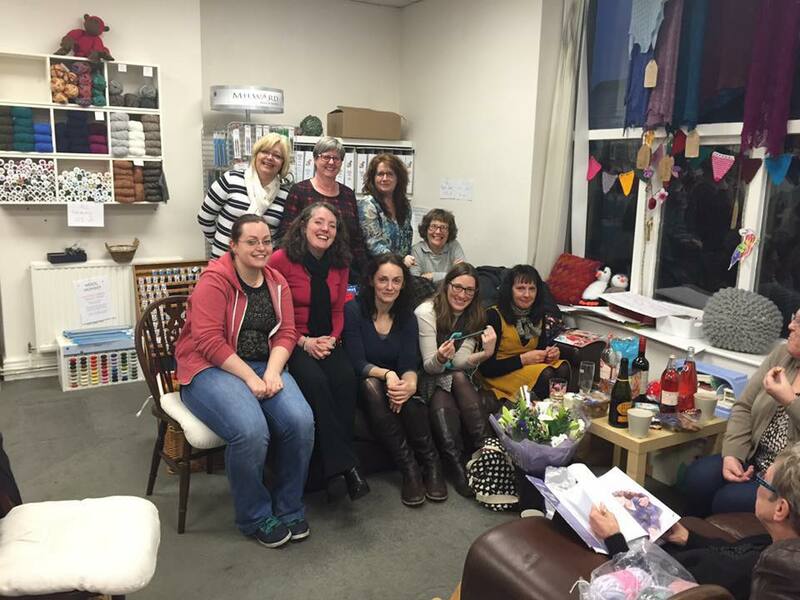 The groups started when I originally opened the Wool Monkey shop. They started small in number but have grown in strength since. New members join from time to time, which keeps the group growing and keeps adding fresh ideas and new impetus. 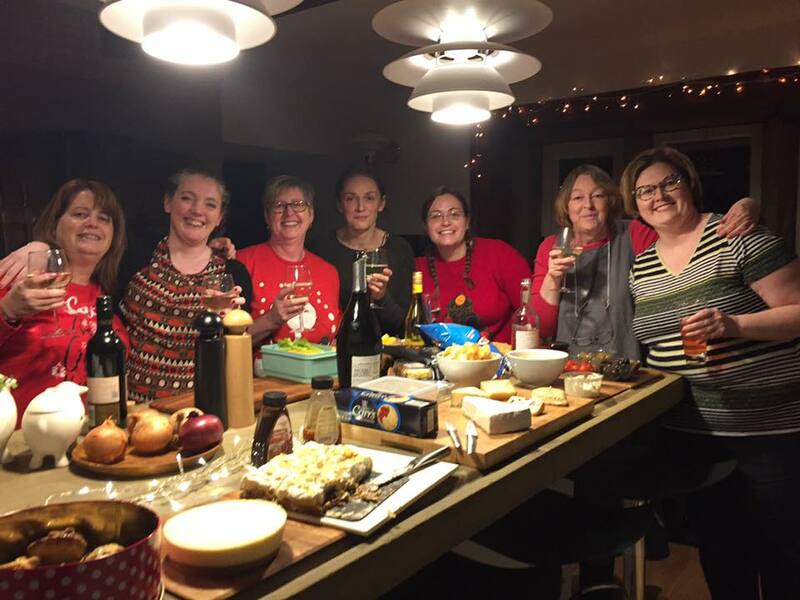 We have had many, many giggles, some cracking outings and some great gatherings. 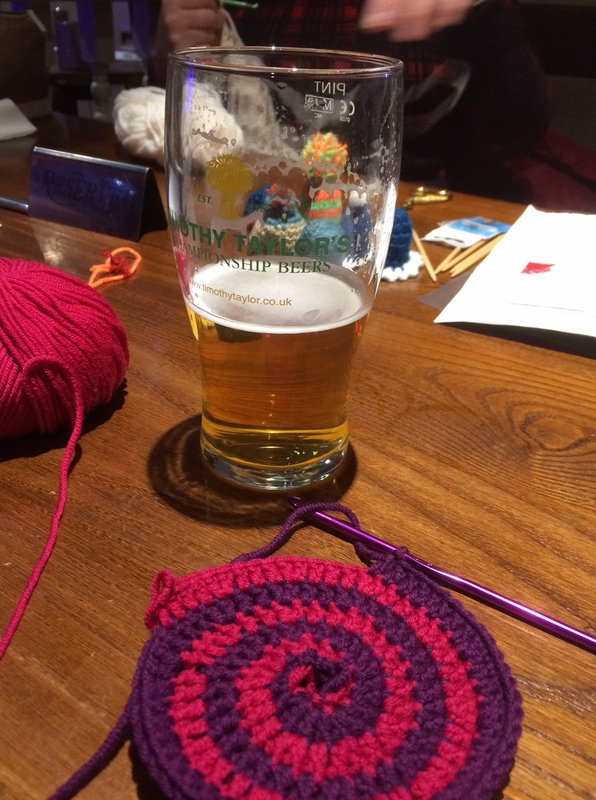 These were from last years Xmas knit and chat, in the pub. 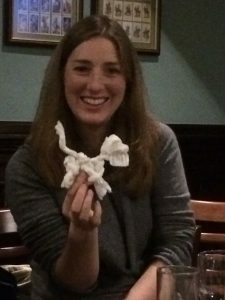 The ladies are such great sports considering that I made them all knit with toilet paper, followed by a knit behind your back competition. 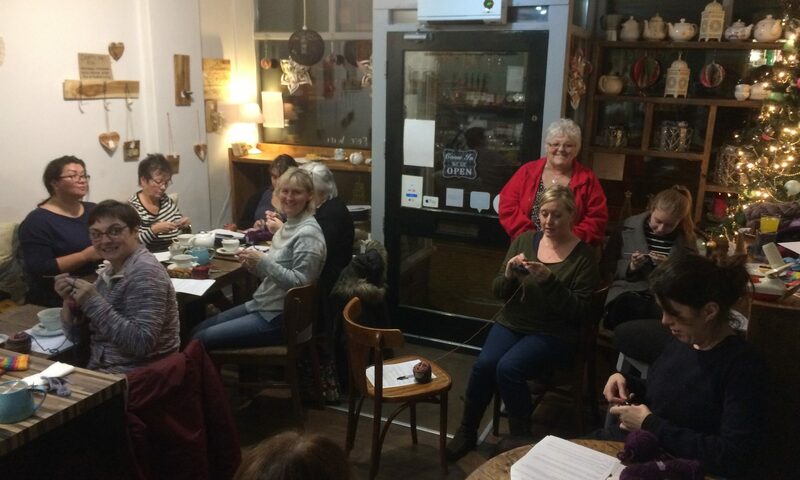 There are two knit and chat groups these days, Saturday evening and Tuesday mornings, both of which have continued long after the Wool Monkey shop has closed. They really are a great bunch of ladies. A somewhat eclectic mixture without a doubt, but very caring and very supportive of each other. 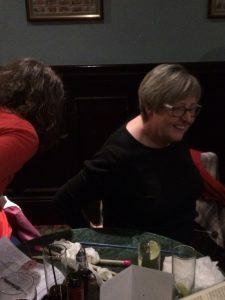 They go on outings together, (almost always involving some kind of woolly event of course), they’ve helped me yarn bomb on the odd occasion, they teach and inspire each other and they looked after me when I had to close my shop. 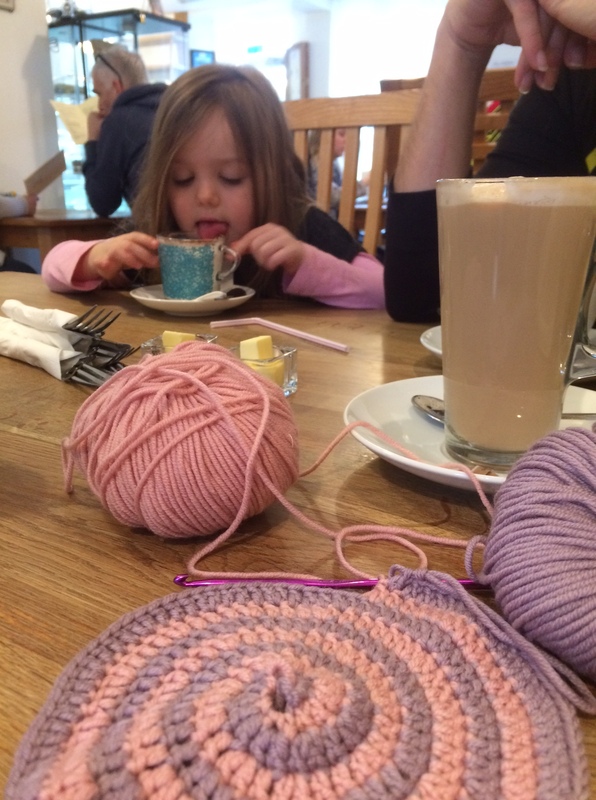 Oh, and they’re always up for showing off their knitting! So, thank you ladies for being such a fab group, let’s keep it going. I am looking forward to seeing what sort of stuff we can get up to next year! 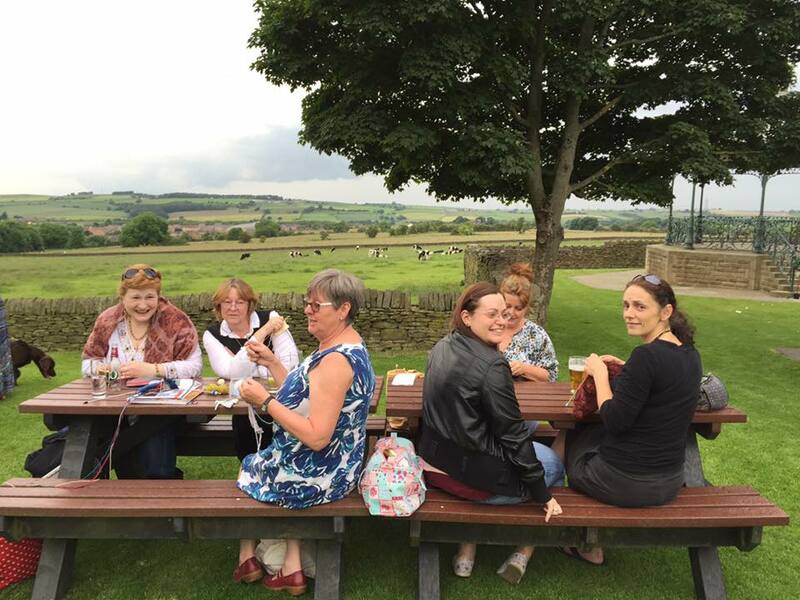 If you are interested in joining our knit and chat groups, do get in touch so we can let you know where we are meeting, newcomers are always very welcome. Well, the time finally arrived for the first Craft Creme workshop. I spent the whole day waiting for this workshop, mainly as I was really looking forward to a piece of cake from the Cafe. (Karen does do exceedingly good cakes). 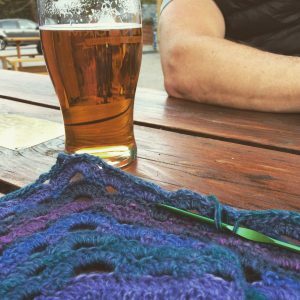 Of course I was looking forward to seeing a few faces I haven’t seen for ages too and getting stuck into a bit of crochet. 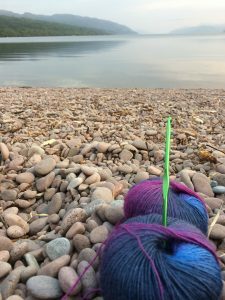 I must admit I didn’t know how exactly many people were going to turn up, so I just bagged up as much yarn as I could carry, with hopefully enough hooks and patterns. We had a full room! 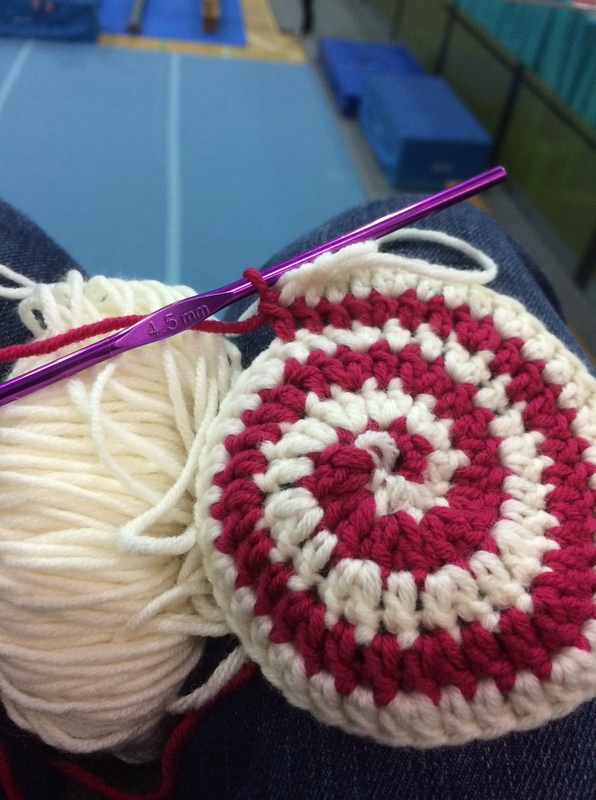 It was a little bit hard trying to juggle the number of absolute beginners we had all in one go, but they did all go home crocheting. In a fashion. You all worked sooooo hard, I was very impressed. I think I need to spend more time teaching some folks, mentioning no names (Ja*** ), but that’s fine, we can work on it. I hope they will come and find me if they need a bit of extra help and there is always the knit and chat sessions, where you can get help and continue to learn. I know some of you will have gone home and finished your first mitt straight away. Here is the first one I have received a picture of this morning. Suprise, surprise it’s Karen’s and it looks fab! So, who’s gonna be the first to fnish a complete pair I wonder? (Not counting mine, I’ve already done several). 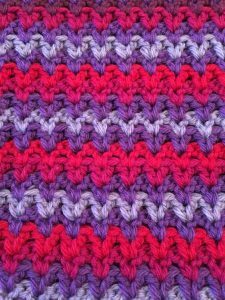 I’m going to hopefully get around to posting some beginner crochet notes on the tutorials page over the next couple of days, to help those of you who have only just started, so, watch this space.